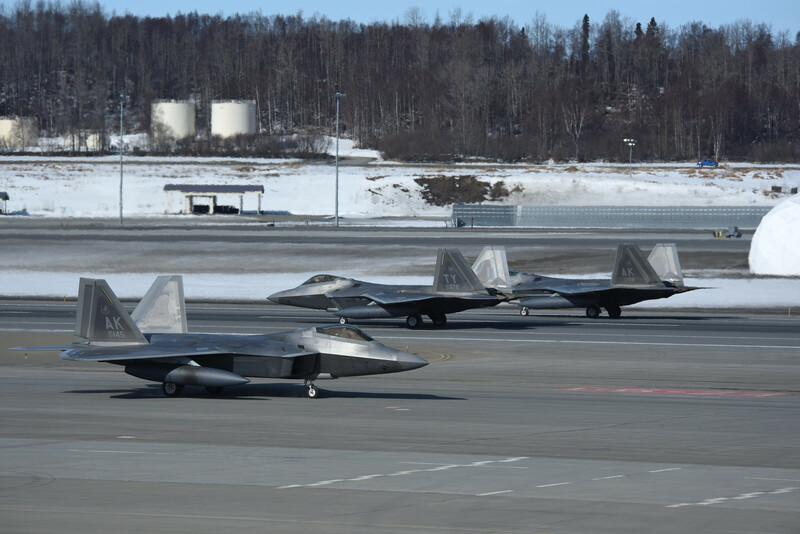 F-22s from Elmendorf participating in the just completed exercise Winter Fury and continuing with exercise Patriot Grizzly at MCAS Miramar. 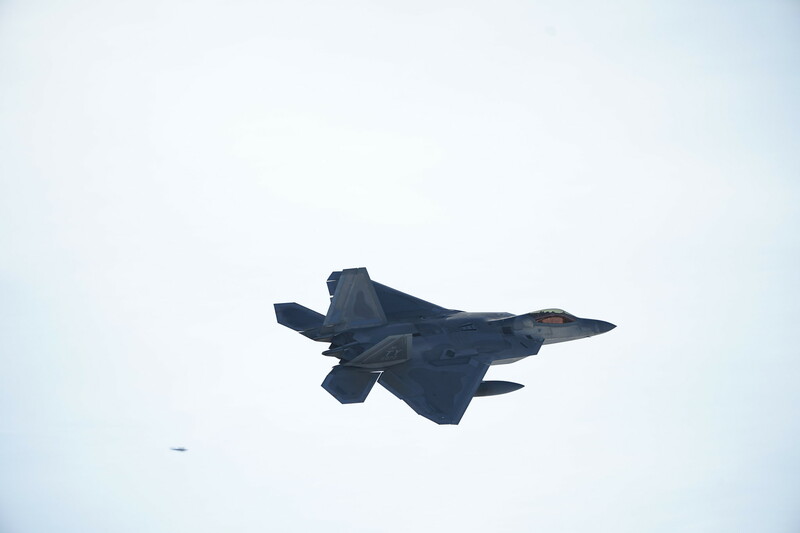 Winter Fury involved both Marine F/A-18C Hornets, and Navy F-35C Lightning II’s, partnering with F-22s to perform air-to-air combat, while protecting ground assets. Patriot Grizzly is an in house exercise with Marine Hornets. 11 February shot of a Langley F-22 underneath it's solar power overhang on the flightline. F-22s were staged as part of a routine night flying training mission. FLOTUS Melania Trump and 1st FW CC Jason Hinds touring FF 165 during her recent trip there. The 1st Fighter Wing recently exceeded the minimum number of sorties set for the month of January by launching more than 250 sorties in three days at Joint Base Langley-Eustis, Virginia. The 1st FW teamed up with the 192nd Wing and members assigned to the 633rd Logistics Readiness Squadron to accomplish this record-breaking sortie goal in an effort to maintain combat mission readiness. Hinds explained that due to obstacles such as weather, birds on the flight line and equipment maintenance, the wings planned to perform a three-day surge to ensure they hit their desired goal, during which six hot pits were assembled and more than 250 sorties were launched. Hot pits are typically performed during combat situations to rapidly refuel aircraft while their engines are running, enabling them to jump right back into the fight. Both Hinds and Harris agreed that the sortie goal was accomplished by empowering Airmen to improve and innovate current procedures. Consistent open communication was key to the objective of making every Airman understand that they have ownership in the mission and the ability to make it better. One such contributing member was Senior Airman John Roach, 1st FW dedicated crew chief, who supervised new Airmen during their first surge. Roach explained how the maintenance teams rallied as they approached the end of the month and hitting the targeted sortie number was within arm’s reach. Feb. 1 was named the 1st FW’s Goal Day and all participating Airmen were rewarded with the day off to celebrate with friends and family. Hinds said he made the accomplishment announcement at the wing’s quarterly awards ceremony to a room full of fired-up Airmen who were beaming with pride and morale. Langley F-22s conducting night ops 21 February 2019. 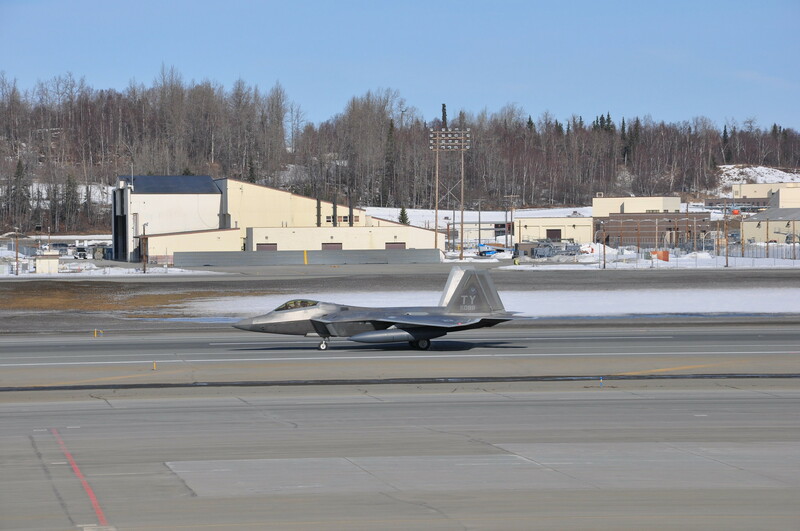 U.S. Air Force F-22 Raptors from the 1st Fighter Wing and 192nd Wing, with the support of the 633rd Air Base Wing, took part in a total force exercise at Joint Base Langley-Eustis, Virginia, Feb. 28, 2019. 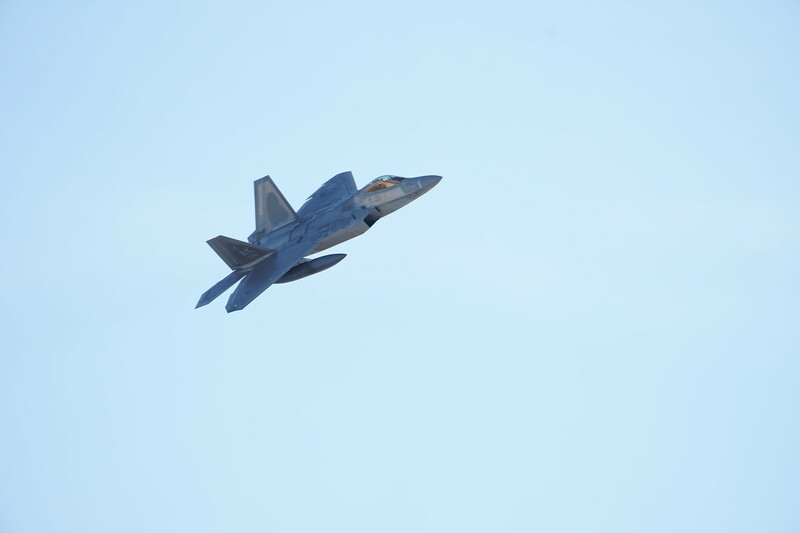 The Phase I exercise showcased the U.S. Air Force F-22 Raptors’ readiness and ability to deploy. With their slogan of ‘ready to deploy, ready to employ,’ the exercise tested the Wing’s ability to generate aircraft and get them to the fight. Once there, the Raptors were regenerated and reconfigured for war, flying sorties from the deployed location. As part of the exercise, the Raptors staged an “Elephant Walk,” testing the squadrons’ ability to launch large formations of aircraft at a moments’ notice. 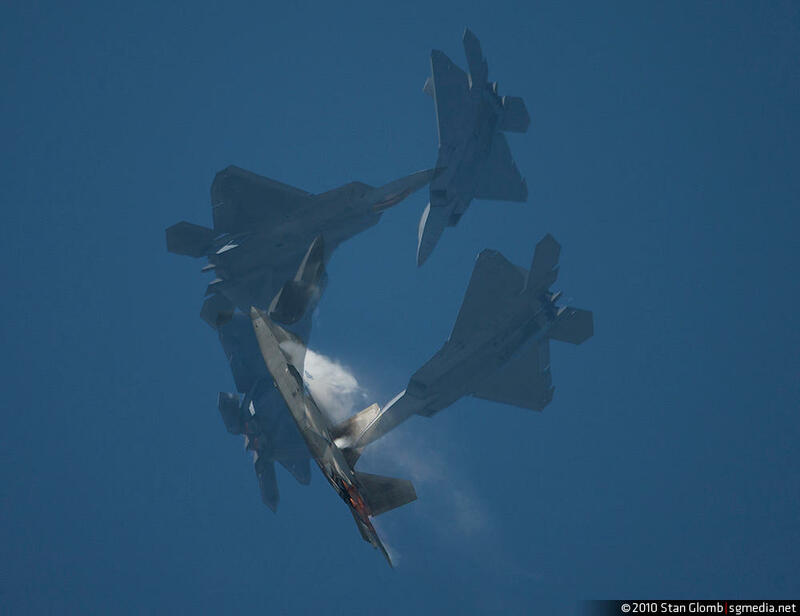 “We know that with the F-22 we’re going to be called, especially in a high-end fight against near peer competitors, they’re going to call Langley and we need to be ready,” Seitz said. Every F-22 is a national treasure, and seeing them always brings thoughts of pride in America and her people. In the words of one F-16 pilot I spoke to, "They did that thing right. 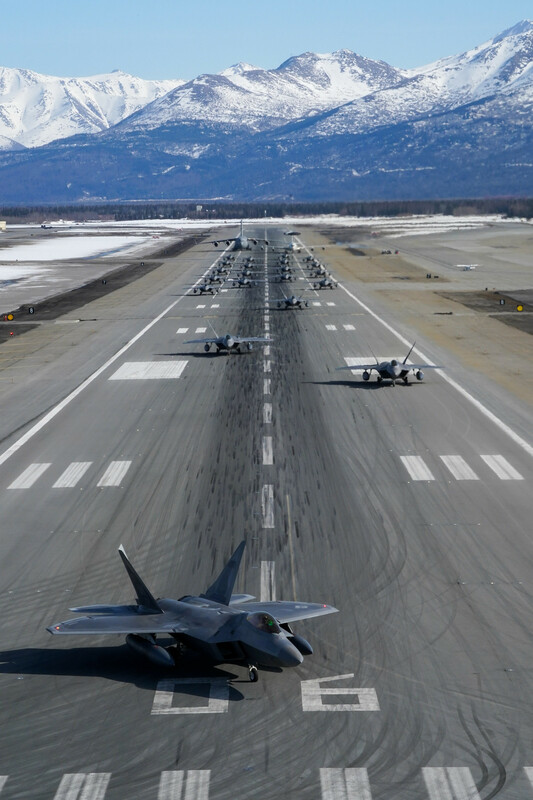 Total overkill..."
Well, about a month after Langley did an elephant walk with their F-22s, Elmendorf decided they'll do one with theirs. 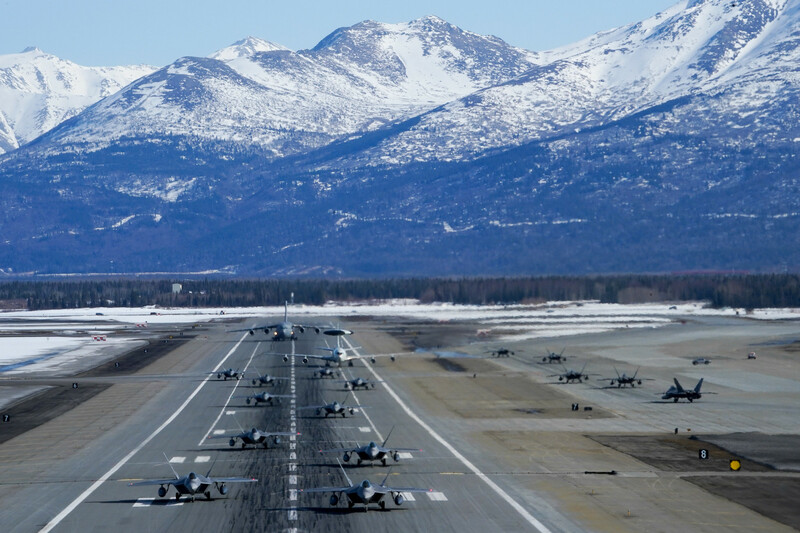 Twenty-four F-22 Raptors from 3rd Wing and 477th Fighter Group, a C-17 Globemaster III and an E-3 Sentry participate in a close formation taxi, known as an Elephant Walk, March 26, 2019, during a Polar Force exercise at Joint Base Elmendorf-Richardson, Alaska. This two-week exercise gives squadrons an opportunity to demonstrate their abilities to forward deploy and deliver overwhelming combat power. If you're an adversary and hear that the US is deploying this many F-22s and other support assets in your neighborhood, you've got to be just a little worried.